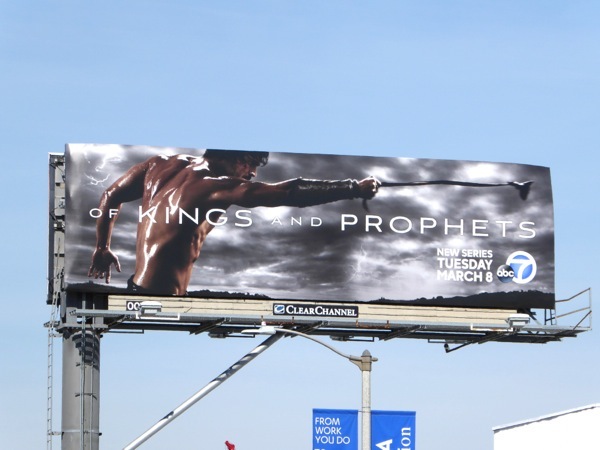 You can tell a new TV season is imminent as the skies of L.A. are filled with a whole host of new billboards for shows trying to grab your attention and capture passersby imagination. 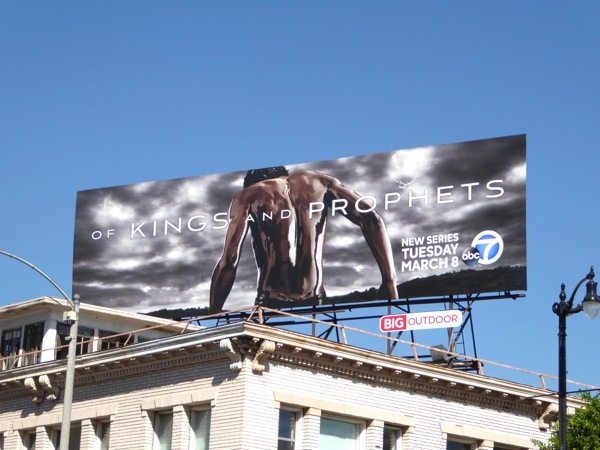 This season ABC Studios is jumping on the Biblical bandwagon and bringing viewers a new series based on the Books of Samuel, including the tale of 'David and Goliath' in Of Kings and Prophets. 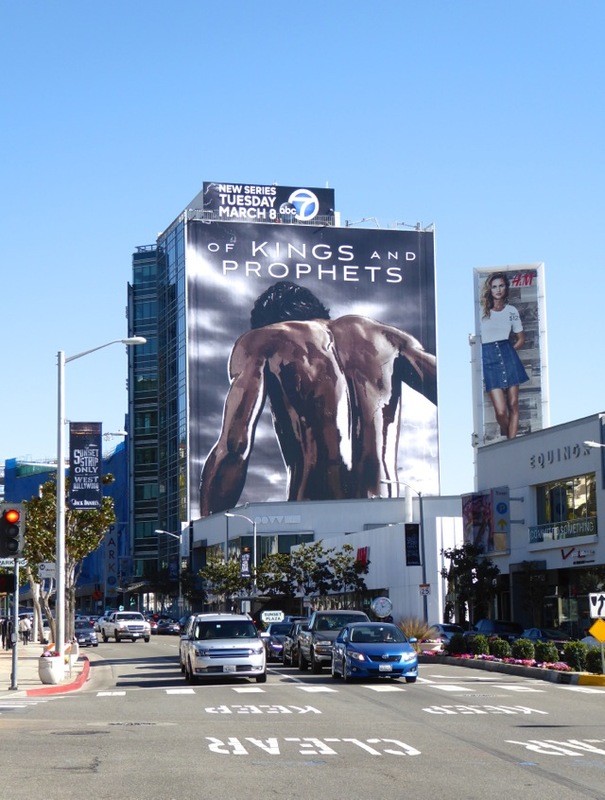 Set a thousand years before the birth of Christ, this tale of faith, ambition and betrayal follows the lives of battle-weary 'King Saul' (played by Ray Winstone), the prophet 'Samuel' (Mohammad Bakri) and the young shepherd 'David' (Olly Rix). 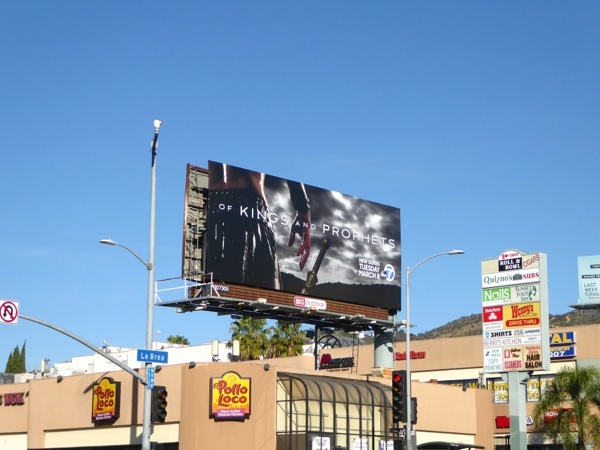 The outdoor ad campaign for the new series certainly has an epic feel to it, and they seem to be trying to channel the gravitas and grittiness of HBO's Game of Thrones in these ad creatives. 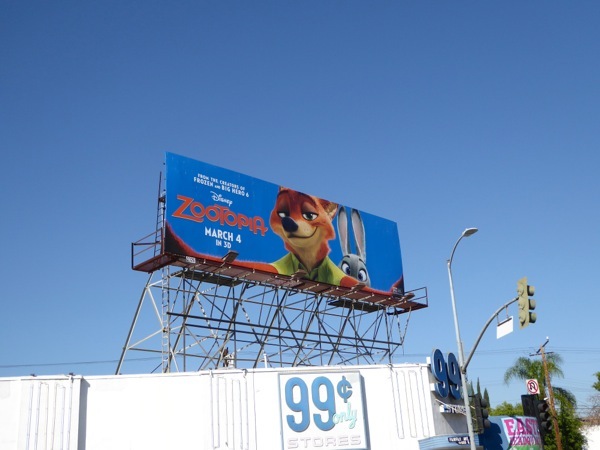 Also helping to make these billboards stand out is the painted over look that resembles the film style of 2006's A Scanner Darkly. 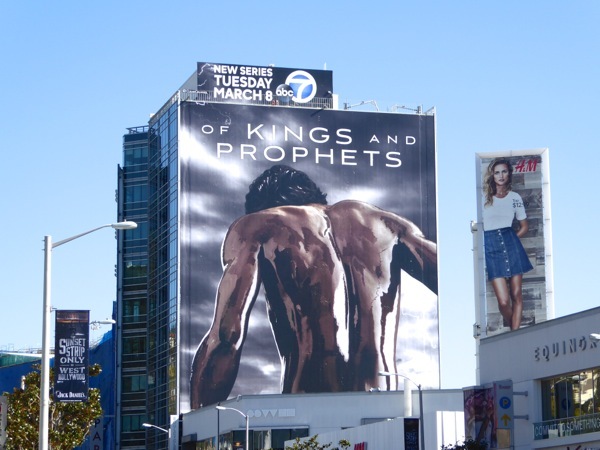 The imposing giant-sized billboard for Of Kings and Prophets was snapped towering over West Hollywood's Sunset Strip on February 5, 2016. 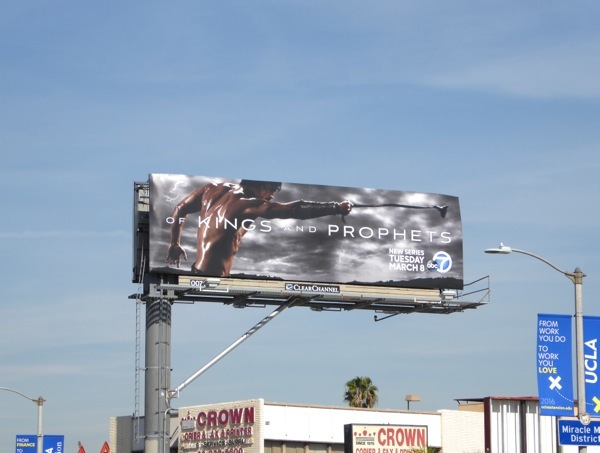 The other dramatic landscape billboards for the series were spotted from February 12 to February 15, 2016 above Sunset Boulevard, La Brea Avenue and Hollywood Boulevard, with the infamous slingshot battle David and Goliath depicted along Highland Avenue. It's interesting ABC Studios decided to try this kind of Biblical drama after NBC's A.D. 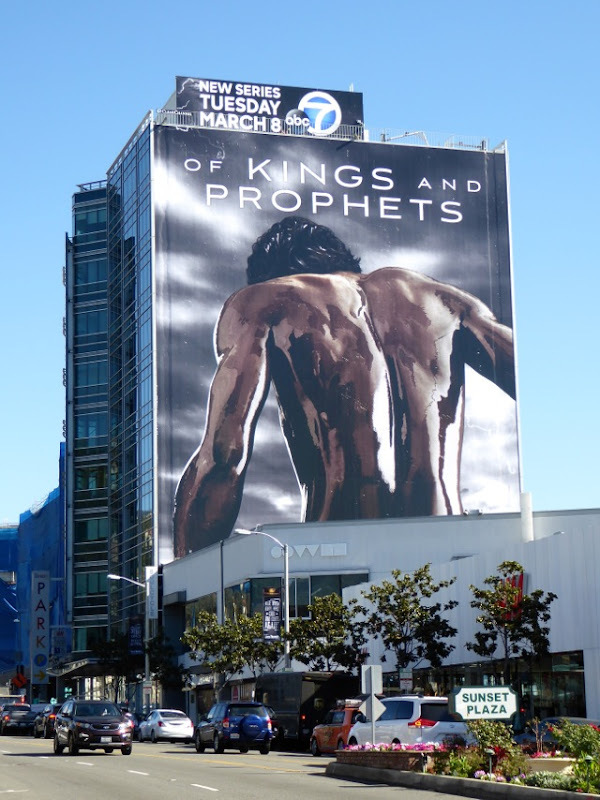 The Bible Continues only lasted one season, but these days networks seem to be willing to try anything to compete with the streaming services stealing audiences with fresh and compelling original shows. Then again naysayers said that ABC's fairytale series Once Upon a Time would never work and that show's currently enjoying its fifth season. 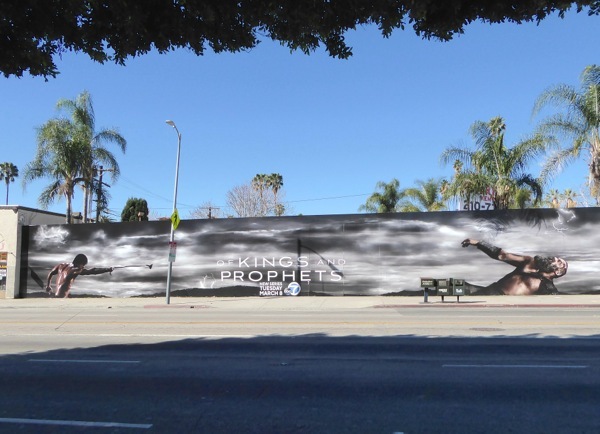 For more dramatic Biblical epics, be sure to also check out these movie billboards for Exodus: Gods and Kings and these Noah movie billboards. 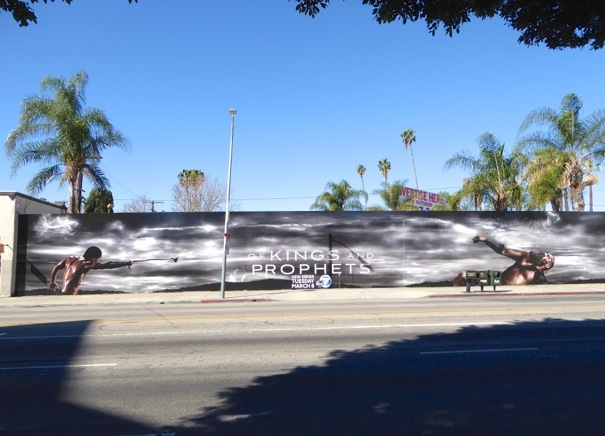 Only time will tell what the future holds for this new series, we could really use a prophet at a time like this. 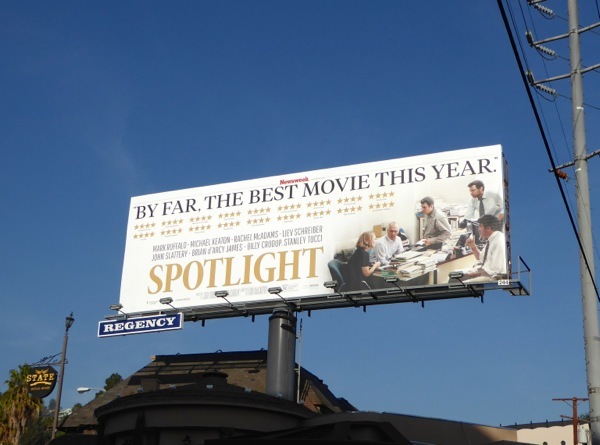 If there's one film that deserves to take home a handful of Oscars today (and it's nominated for six Academy Awards), it's Spotlight. 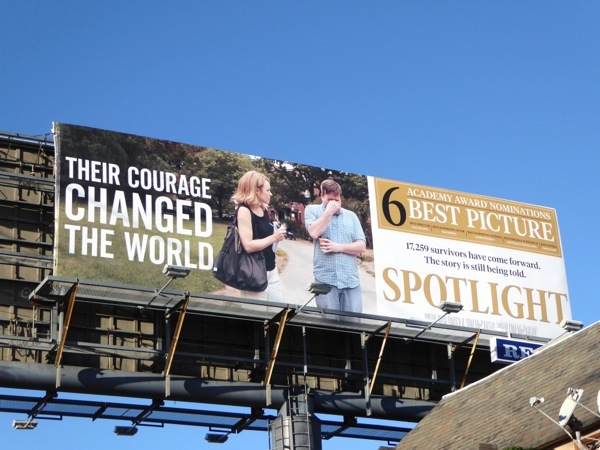 In Daily Billboard's opinion, the true story of The Boston Globe's Pulitzer Prize-winning exposé on the Catholic Church's cover-up of child molestation by its priests around the world is an award worthy movie. 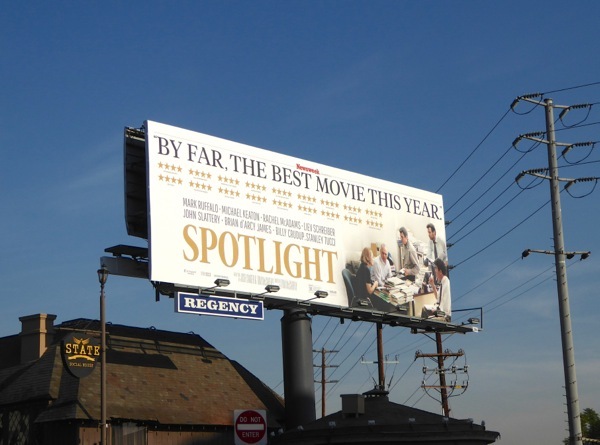 The brilliant cast including Oscar-nominated Mark Ruffalo and Rachel McAdams, plus Michael Keaton, Brian d'Arcy James, Liev Schreiber, John Slattery and Stanley Tucci really were very deserving of the Screen Actors Guild Award for Outstanding Performance by a Cast in a Motion Picture. 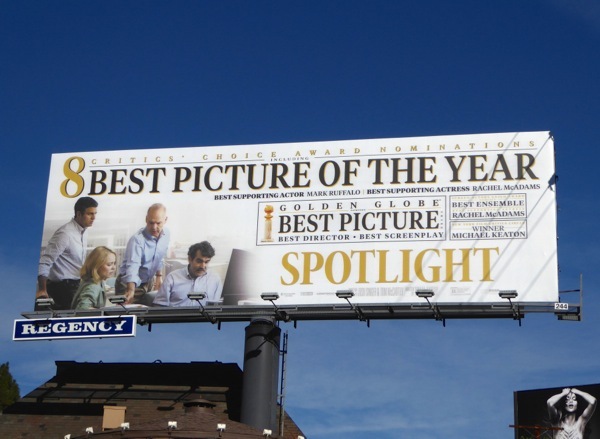 The idea that people in the church would take advantage of the most vulnerable and prey on those needing love, hope and guidance is despicable, but Spotlight never sensationalises the investigation. The pace and storytelling of the film is methodical, just like the journalists efforts, laying the facts out for you to interpret yourself, and what is basically a story about news reporters researching an article never feels boring, and is equally enlightening, compelling and horrifying. One of the most powerful moments in the film come's when Mark Ruffalo's reporter, 'Mike Rezendes', makes an impassioned speech, and also a quieter moment between Rachel McAdams character and her devout Catholic grandmother as she reads the published Boston Globe article for the first time is very moving. By the end of the film you may shed a tear or two, whether they are tears of sadness or anger may depend on how this real-life abuse affects you and your family. 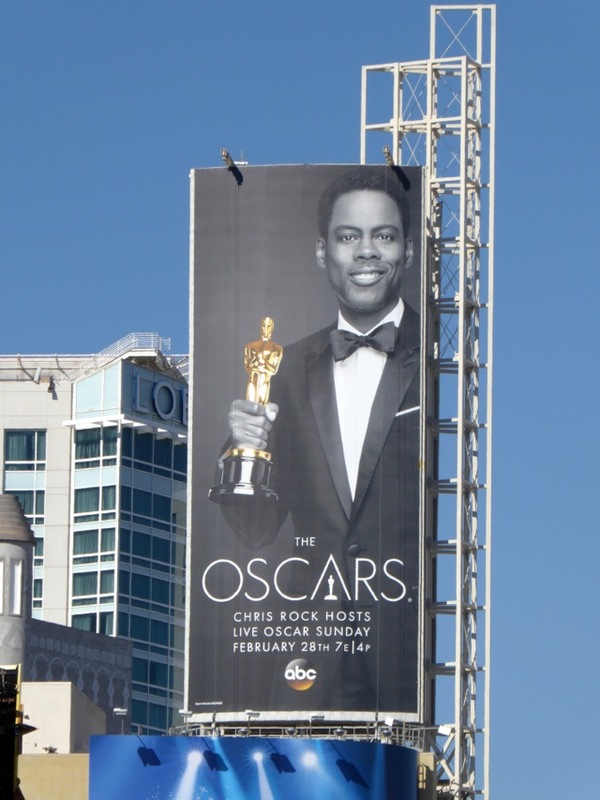 From one scandalous event to another established organisation mired in controversy again this year, as Chris Rock hosts the 88th annual Academy Awards. 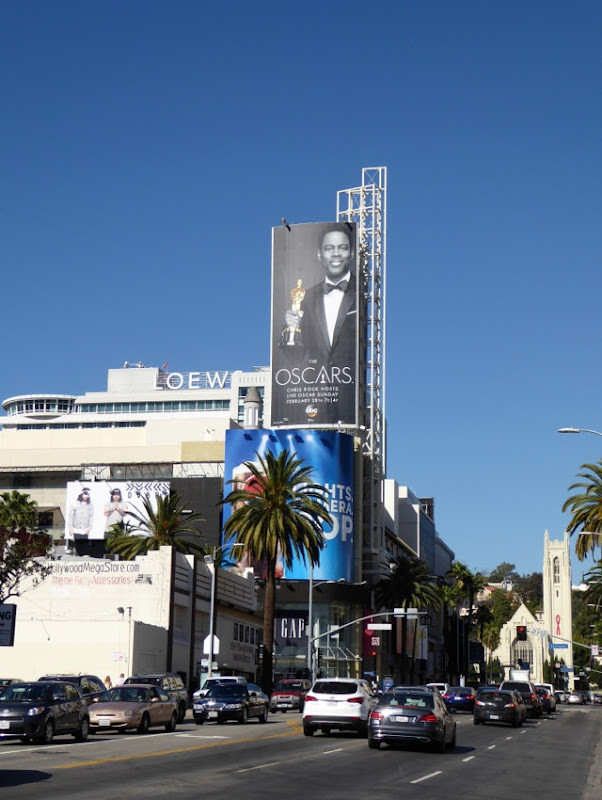 The Academy of Motion Picture Arts and Sciences has once again been criticized for 'white-washing' the Oscar nominations and not properly acknowledging the accomplishments of people of colour and ethnicity, and their work this past year. 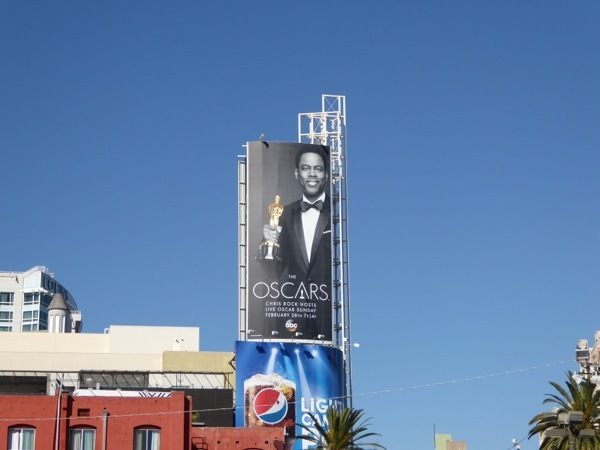 This Chris Rock billboard for the Oscars was photographed high above Hollywood & Highland (and The Dolby Theatre where the awards ceremony is held) on February 15, 2016 (although in this time of scrutiny was it the best idea to present him in stylish black and white, rather than in full technicolour?). It'll be interesting to see how the comedian and actor uses his hosting duties to address the lack of diversity this year. 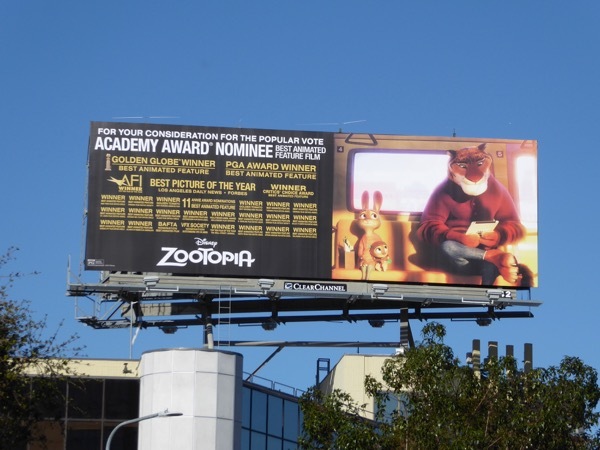 If you're a fan of the Hollywood's biggest awards, be sure to also check out these other Oscars host billboards from previous years. 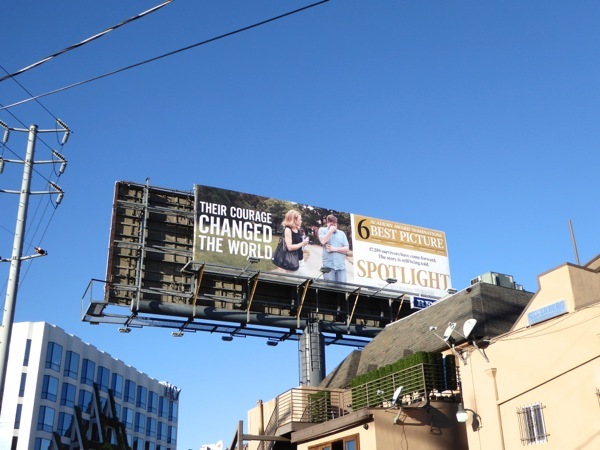 Meanwhile the 'Their courage changed the world' Oscar consideration billboard for Spotlight was photographed on February 6, 2016, the Critics' Choice and Golden Globe version was snapped on December 23, 2015, whilst the Newsweek quote version was spied on December 9, 2015. 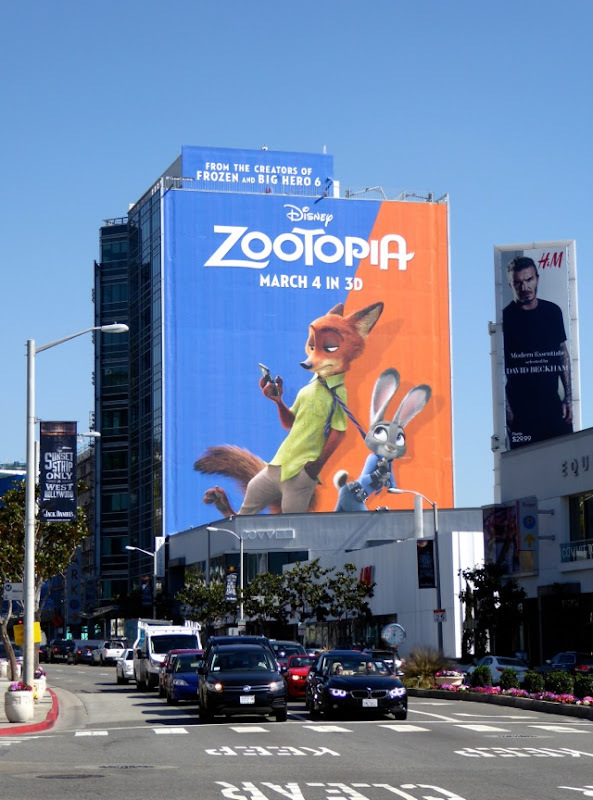 Movies should always be able to entertain audiences, but it's even more impressive when they can inform and move people in a compelling way at the same time. 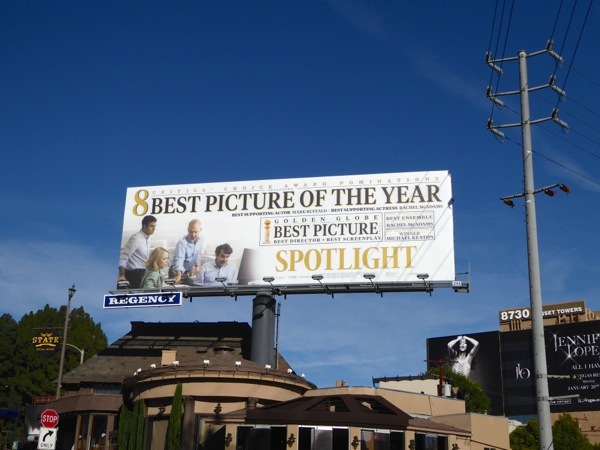 Let's hope that Spotlight can take home a golden statue, or two, this year at the prestigious event. 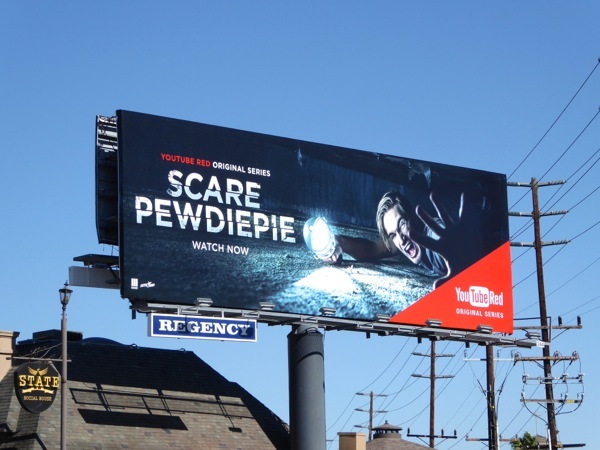 YouTube is known the world over for its funny cat videos, viral sneezing pandas, music videos and short-form content and personalities, but after the likes of Amazon, Netflix, Hulu and even Sony PlayStation producing their own original, critically-acclaimed content, you knew it wouldn't be long before the Google-owned video channel was producing its own movies and TV shows, for a fee of course. 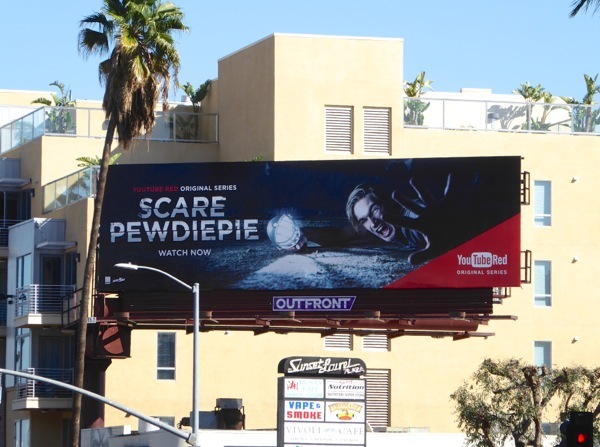 YouTube has spent the last two years building up the profile of its online celebrities and shows with outdoor advertising, like these billboards for Video Game High School, these Grace Helbig and Hannah Hart YouTube billboards and these Tyler Oakley and Lilly Singh YouTube billboards. 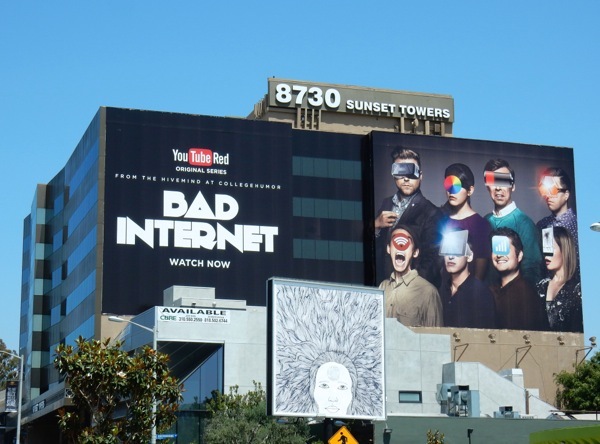 Now the video streaming platform has launched YouTube Red, a new paid-for monthly subscription service allowing members-only to view original series and films from top YouTubers mostly ad free. 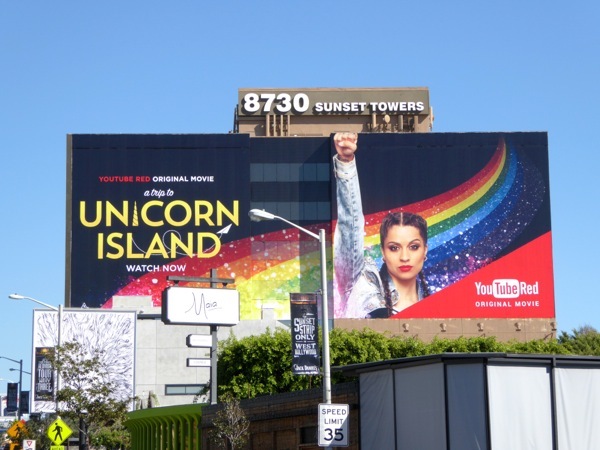 Some of the first offerings include A Trip to Unicorn Island, a documentary film following vlogger sensation Lilly Singh aka 'IISuperwomanII' on her world tour, a horror series starring the most popular YouTuber, 'PewDiePie', recreating classic video game situations in Scare PewDiePie, and Lazer Team from Rooster Teeth, a sci-fi comedy about four losers who discover some alien technology and have to protect the planet, which already received a limited theatrical release. What do you think? 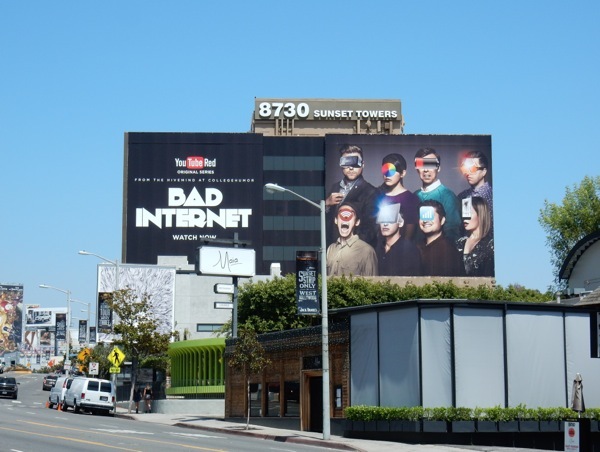 Are you ready to start paying to watch your favourite YouTubers instead of just putting up with countless ads, or is there already enough TV being produced at the moment to satisfy your entertainment cravings. 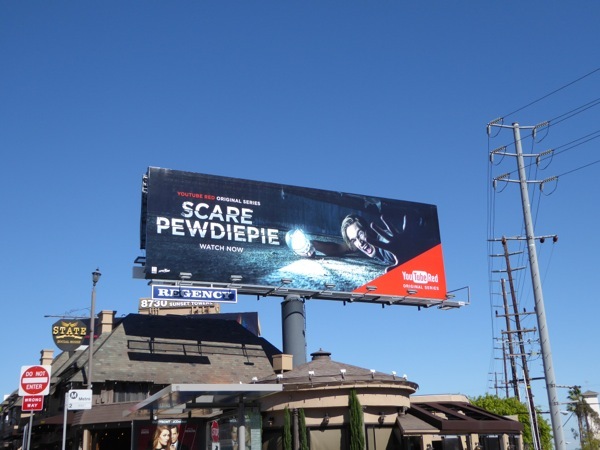 UPDATED: Here's also a better shot of another outdoor ad for YouTube Red's Scare PewDiePie series. 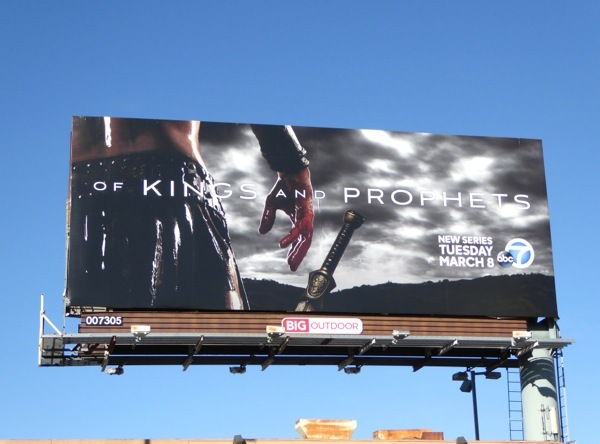 This additional billboard was snapped on March 8, 2016 further west along the Sunset Strip at Holloway Drive. 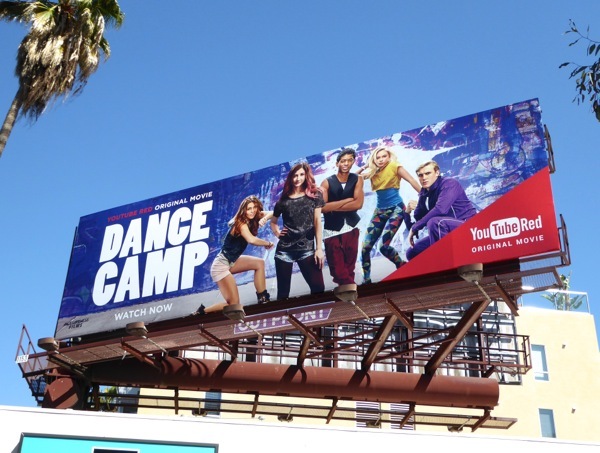 UPDATED: In addition here's another original movie billboard from YouTube Red, Dance Camp, starring Meg DeAngelis and Nadji Jeter and snapped along Sunset Boulevard on March 31, 2016. 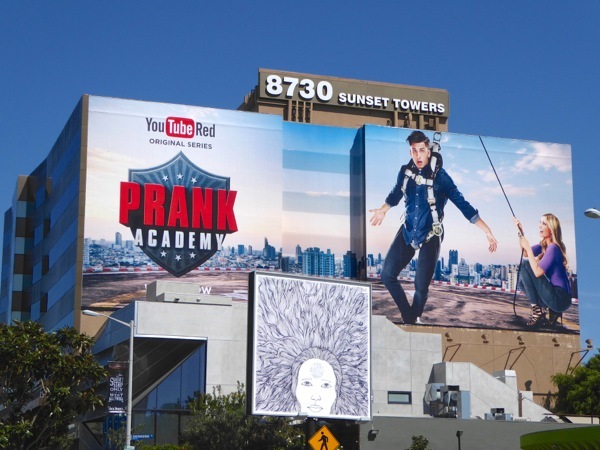 Meanwhile Lilly Singh's giant Unicorn Island billboard was replaced with this super-sized ad creative for new original series, Prank Academy. 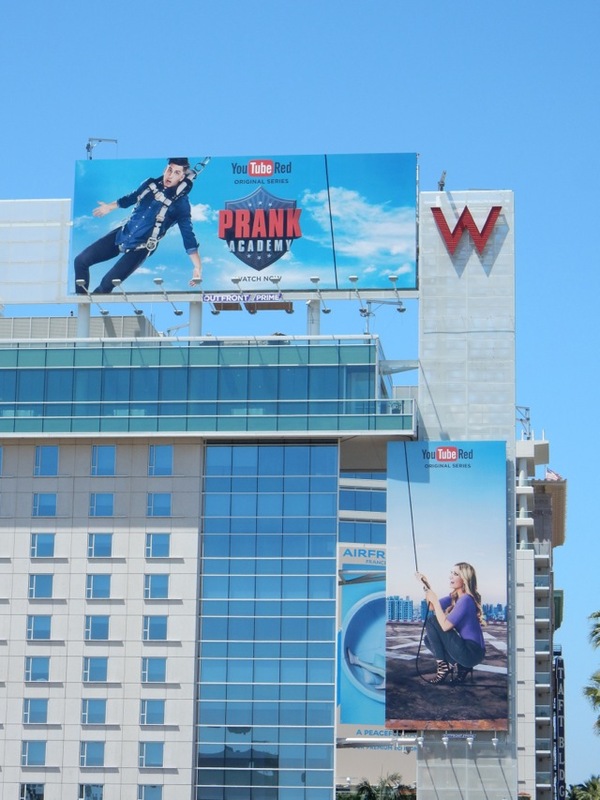 This new show is from the creators of YouTube channel PrankvsPrank, Jesse M. Wellens and Jeana Smith, and now they're ready to pull of the most killer pranks in this new hidden camera series. 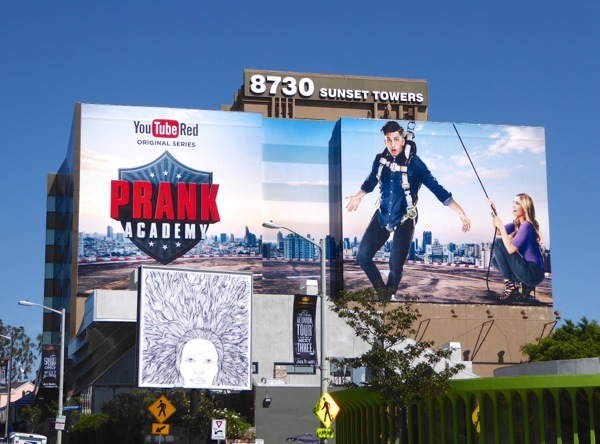 This eye-catching Prank Academy billboard was snapped along the Sunset Strip on March 31, 2016. 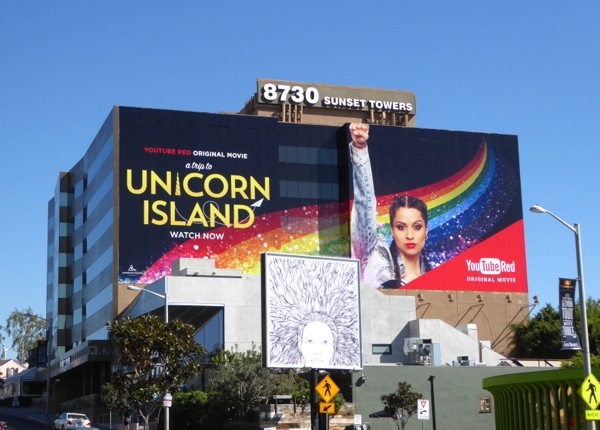 UPDATED: Here's another original TV series billboard for YouTube Red photographed along the Sunset Strip on April 20, 2016. This Foursome is of the non sexual variety and features 'Andie Fixler' (Jenn McAllister) and her three best friends (hence the title), her big brother and her high school crush. 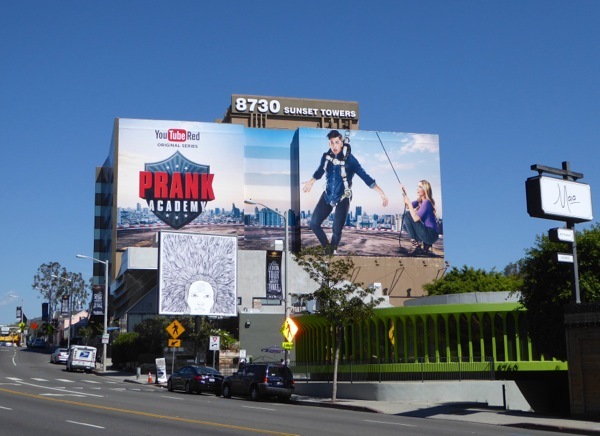 UPDATED: In addition here's also a clever execution of the Prank Academy ad creative on the side of the W Hotel Hollywood spotted along Hollywood Boulevard on May 2, 2016. 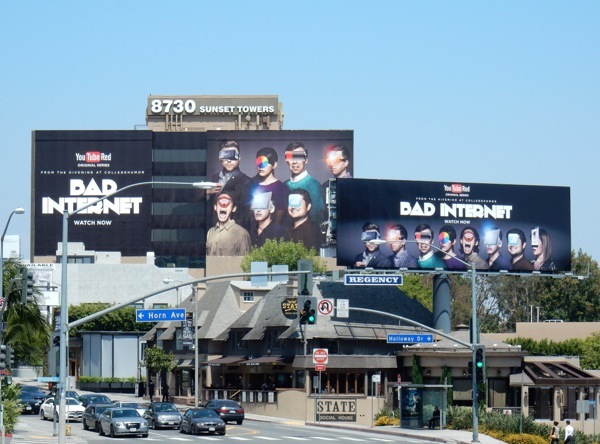 UPDATED: Here's another new YouTube Red show getting a big push along Sunset Boulevard, Bad Internet. 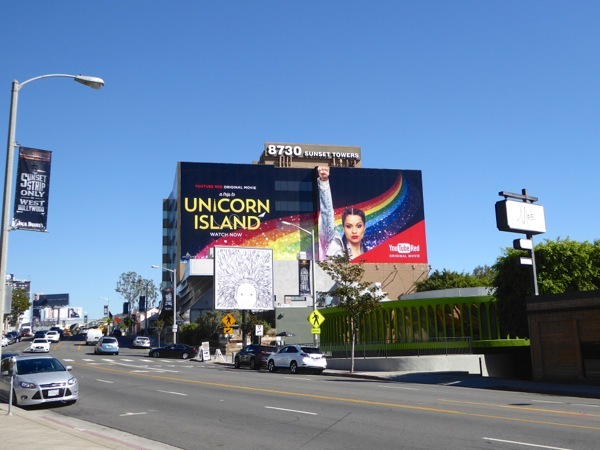 Not only does it get a giant-sized billboard on the side of Sunset Towers in West Hollywood but it also gets an additional standard landscape billboard directly in front of jot for maximum impact along the busy commuter route. 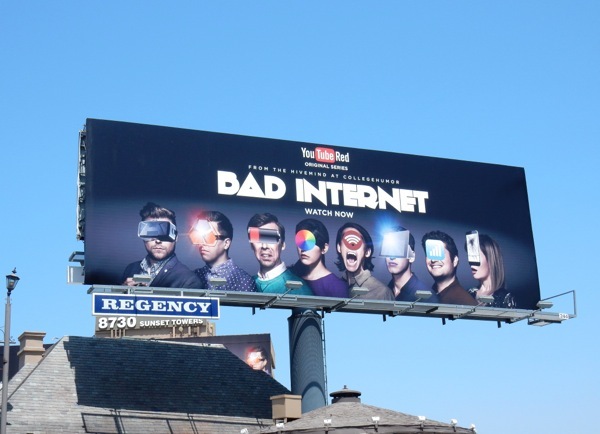 Photographed on May 26, 2016, these eye-catching billboards are for the new series from CollegeHumor, described as a parody of the Black Mirror TV anthology drama series which thematically examines the impact of technology on society in weird and wonderful ways. 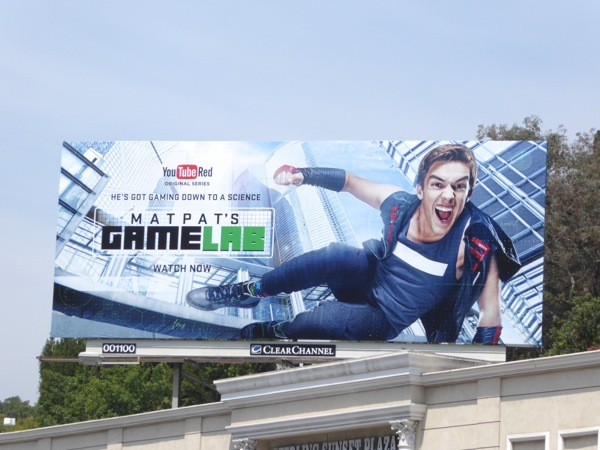 UPDATED: Here's an action-packed billboard for another new YouTube Red show all about video games, MatPat's (Matthew Patrick's) Game Lab, snapped along the Sunset Strip on a gloomy June 6, 2016. 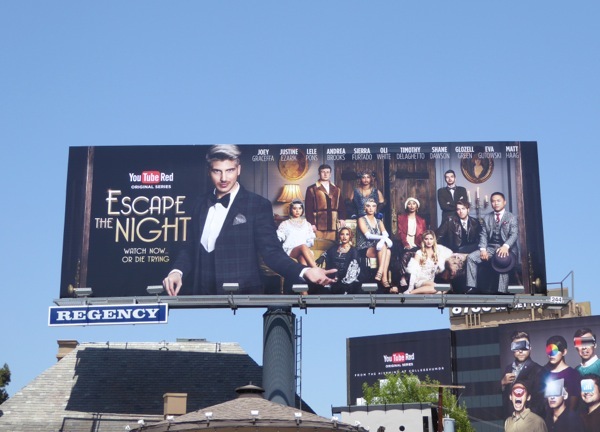 UPDATED: Yet another YouTube Red series takes to the skies, this time Joey Graceffa invites ten YouTube personalities to a 1920s murder-mystery party in Escape the Night. 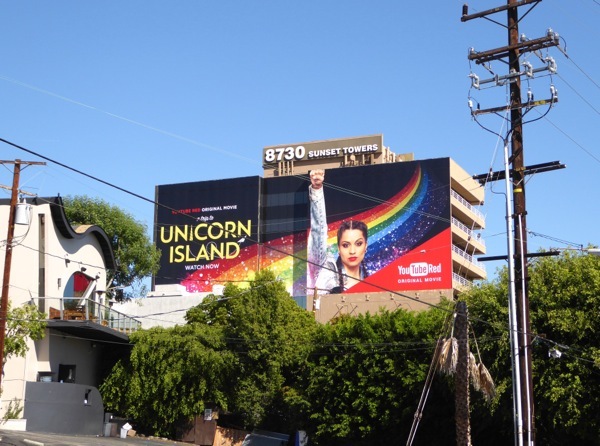 This billboard was snapped along the Sunset Strip on June 23, 2016. 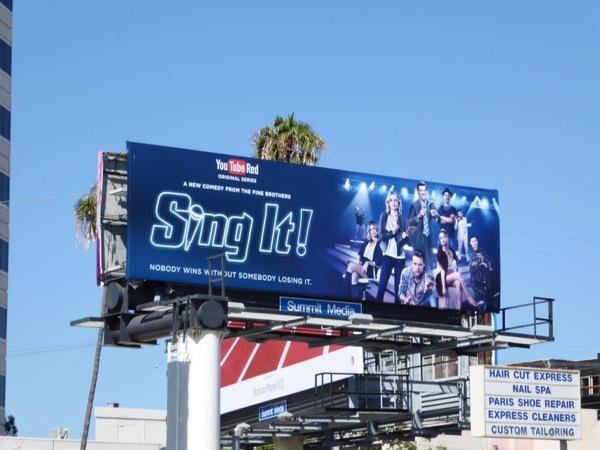 UPDATED: Here's another offering from the online platform, Sing It!, a half hour scripted comedy poking fun at all the reality singing competitions on TV, snapped along Wilshire Boulevard on July 19, 2016. 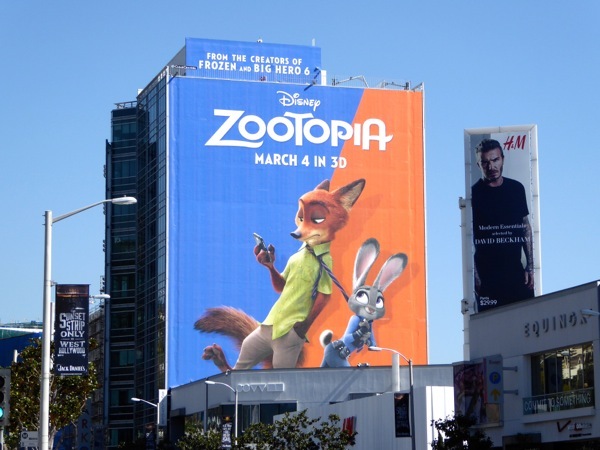 Disney has a long history of anthropomorphising animals into iconic characters, some might even say they're the master of doing it, so their new animated movie Zootopia seems the perfect latest addition to the studio's classic big screen offerings. 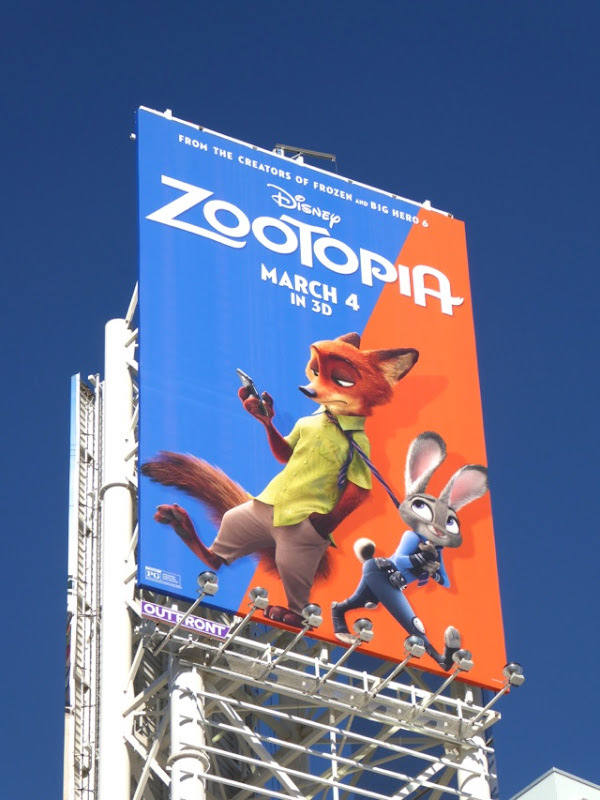 In this cop-buddy comedy set in the modern mammal metropolis of Zootopia, optimistic bunny police officer 'Judy Hopps' (voiced by Ginnifer Goodwin) must team up with the fast-talking, scam-artist fox, 'Nick Wilde' (Jason Bateman), to crack the case of a missing otter and prove herself to her tough law enforcement colleagues. 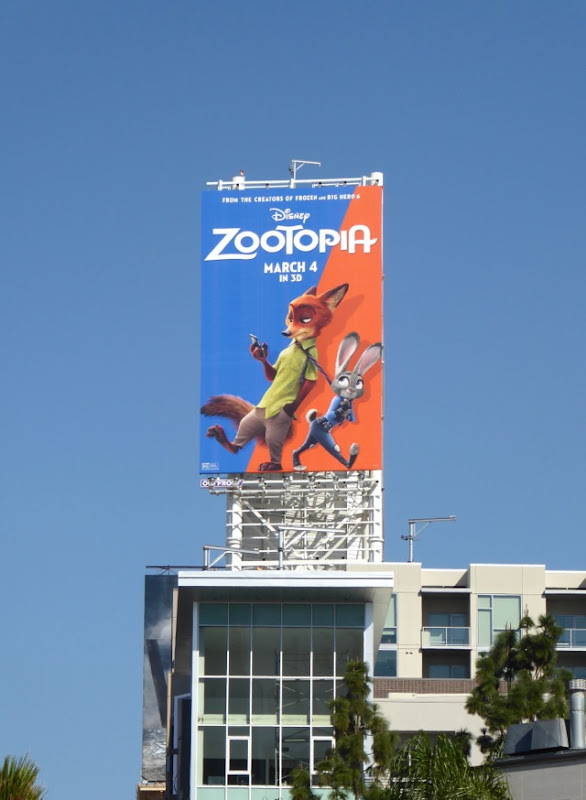 These vibrant and colourful billboards for the new movie really stand out in the skies of L.A. and the 'selfie' style ad creatives help to give the film a fun contemporary feel. 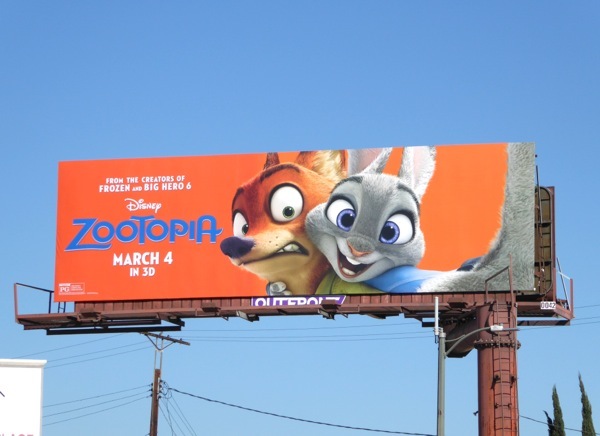 The orange and blue 'selfie' landscape billboards were first spotted along La Brea Avenue on February 5, then snapped along Fairfax Avenue and Pico Boulevard on February 24, 2016. 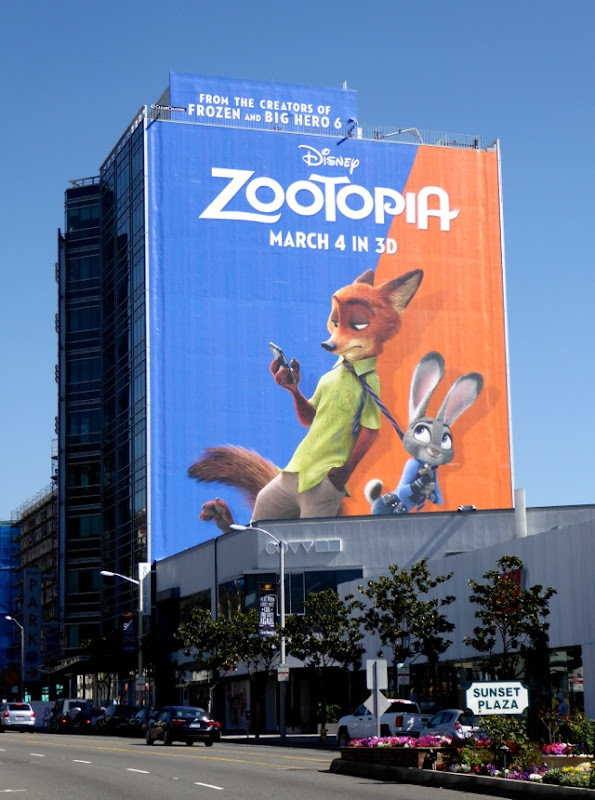 Meanwhile the portrait version was spied high above Vine Street in Hollywood on February 8, and the super-sized Zootopia movie billboard was photographed towering over eastbound traffic along the Sunset Strip in West Hollywood on February 19, 2016. 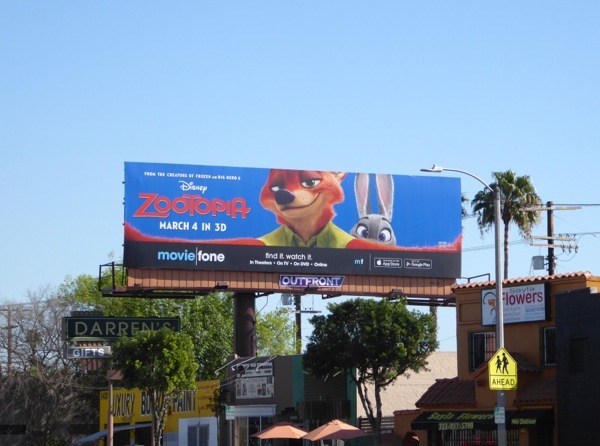 If you're a Disney animation fan, be sure to also enjoy these Frozen movie billboards, Big Hero 6 movie billboards, Wreck-It Ralph movie billboards and Tangled movie billboards, and many more examples here at Daily Billboard. 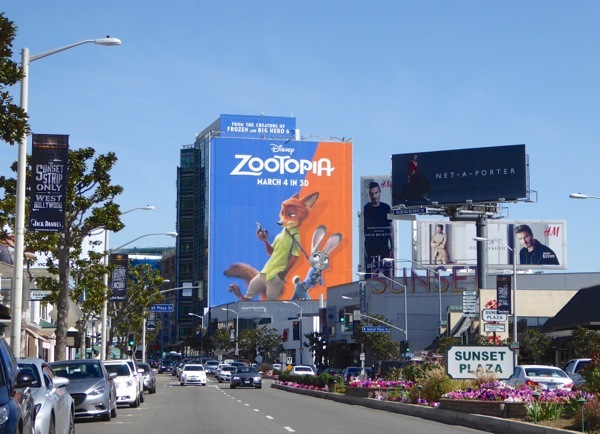 For more anthropomorphised animal characters, be sure to also check out these Madagascar 3 film billboards, these Rio movie billboards and these Kung Fu Panda movie billboards. 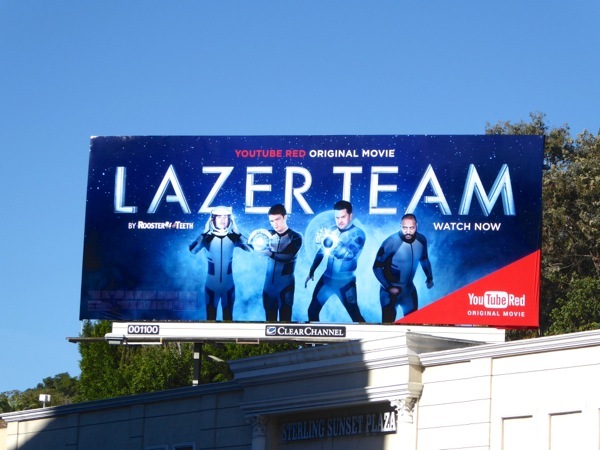 For other selfie style billboards you can also check out this eclectic selection of outdoor ads from the likes of T-Mobile, Zoolander 2, The Muppets most recent TV series and these Best Friends Forever TV billboards. 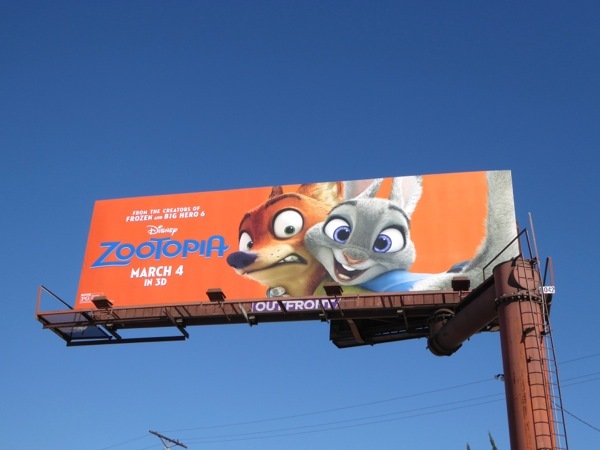 Will you be taking a trip to Zootopia when the film opens in the U.S. on March 4, 2016? Just remember, don't feed the animals (they're more than capable of doing it themselves by the looks of things). 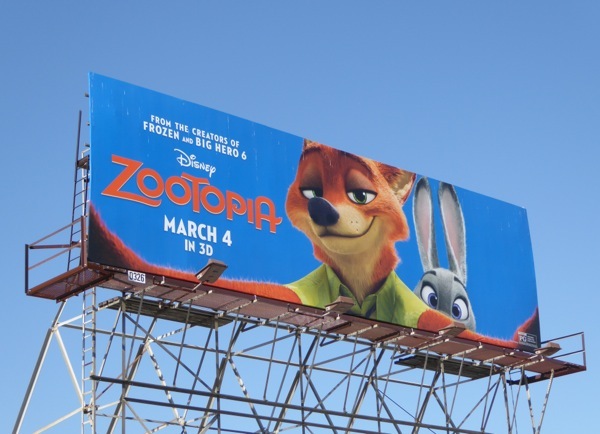 UPDATED: This year Zootopia (or Zootropolis as it was known in the U.K.) not only conquered the box office with over a $1 billion in ticket sales, but the animated Disney feature also has seemed to have won the heart of critics and audiences alike. 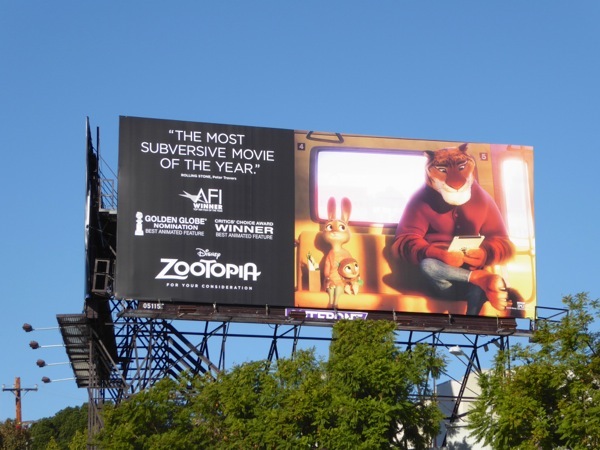 Not only did the original film win Best Animated Feature at the Critics' Choice Awards but it's also nominated for a Golden Globe, and this awards consideration billboard was spotted above West Hollywood's Santa Monica Boulevard on December 28, 2016. 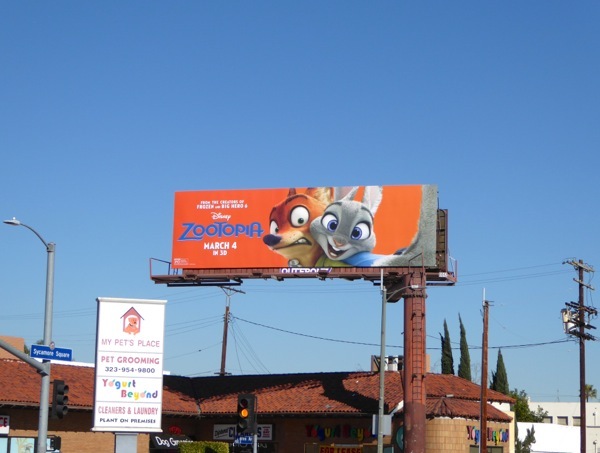 UPDATED: Here's another awards season billboard for Zootopia, this one showing off all the accolades the animated film has already received. 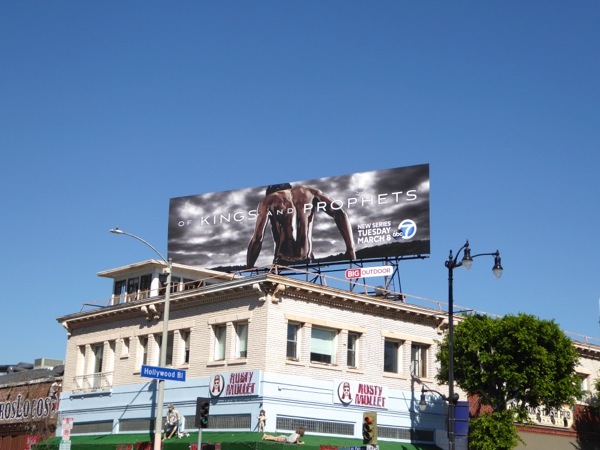 This Academy Award consideration ad creative was spied high above Wilshire and San Vicente Boulevards on February 22, 2017.